There is no silver-lining to lead poisoning. In fact, it is theorized that widespread lead poisoning had a hand in the fall of the Roman Empire. This is because the Roman Elite brewed beverages in lead-made cooking vessels, while bathing with and drinking tap water brought to their homes via lead pipes. Lead paint was widely used in homes and other buildings until it was banned in the 1970’s. It’s still around today, coating buildings and sheds across America. While the paint is left alone, it does not pose much of a threat. However, any movement or abrasion against the surface of the paint can generate dangerous lead dust. The creation of which is not limited to construction, demolition, or remodeling. Simply opening a window or door, or striking a surface coated with lead paint is enough to generate dust. We don’t need to tell you how dangerous the dust is, there are plenty of sources online which list the complications of lead poisoning. However, we can tell you how to safely and effectively neutralize the dangers of old lead paint, while also preventing it from flaking off into dangerous bits of dust. People have been aware of the dangers of lead paint for many years. It has become a top priority for the EPA. They have implemented strict rules and standards governing lead paint. They take this issue very seriously and the penalties are extremely high. The EPA is cracking down on violators of the rules. Property owners of various types are being hit with severe fine running in the hundreds of thousands of dollars. If you are a homeowner or work in any facet of the real estate industry, you need to protect yourself and know how to avoid lead paint penalties. Any home or structure built prior to 1978 has a high likelihood of containing lead paint. Property managers, landlords, real estate agents and homeowners all have different responsibilities regarding lead paint. The EPA requires varied forms to be filed and standards to be met, depending on your role. For example, if you are renovating a home which contains lead paint, it is your responsibility to protect the people working inside the home. There are specific steps you need to take in order to comply with the EPA’s rules. If you are a real estate agent, it is your responsibility to work with the home seller and to disclose information to potential buyers. Again, very precise forms and regulations exist for each particular situation. It is crucial that you know exactly what your responsibilities are in any given situation. You can view the information on the EPA website. Understanding the dangers of lead paint better prepares you to deal with the problem. It is a serious matter. Pediatricians routinely ask parents if lead paint is present in their home. The reason for this is that children are becoming very ill due to lead poisoning. Exposure to high levels of lead is very dangerous. The EPA has appropriate reason for their strict rules. It truly is a very serious hazard. The most important thing you can do is comply with all EPA regulations. Do not attempt to avoid their rules. You will get caught and penalized heavily. Not only does this put people in danger, it puts your own finances in jeopardy you could lose everything. It simply is not worth the risk. Follow through with all required paperwork. Remove or treat the lead paint if necessary. There are many options available for lead paint removal and treatment. Look into all of your options and pick the best fit for your situation. The bottom line is, you must comply. Here is a recent EPA press release about violators being hit with large fines. You can easily avoid lead paint penalties. It is simply a matter of knowing your responsibilities, understanding the risks, and complying with all regulations. It may take some time and effort, but it is the safest option. Ignoring a problem only makes it worse. Obey the laws and deal with the lead paint issue as soon as you discover it. ECOBOND™ is the nation’s leader in developing and distributing products that improve the protection of human health and safety from the hazards of lead in the home, workplace, and the environment. 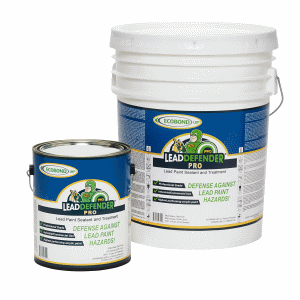 With over 15 years in patented and proven success, the ECOBOND™ family of products have been extensively used in successfully treating lead hazards in over 11,000,000 tons of material while serving over 100,000 customers in the United States and Internationally. Third party independently documented test results utilizing US EPA method confirming the effectiveness of ECOBOND® LBP in protecting human health.